He just hops on their laps and purrs. If there's one member of the intensive care unit at UC San Francisco who holds his head a little higher than most at this premier medical facility, it's Duke Ellington Morris. 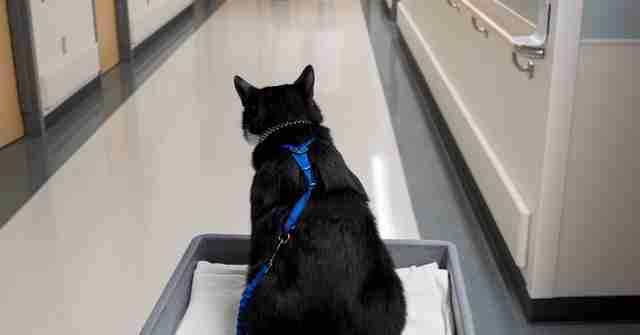 Not many humans, much less a cat, have raised themselves, literally, from the streets to these halls of medicine. 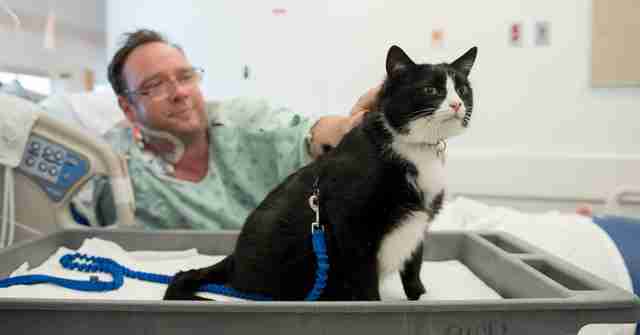 Duke Ellington Morris, or just Duke, spends his days here as a therapy cat brightening just about every corner of the intensive care unit. 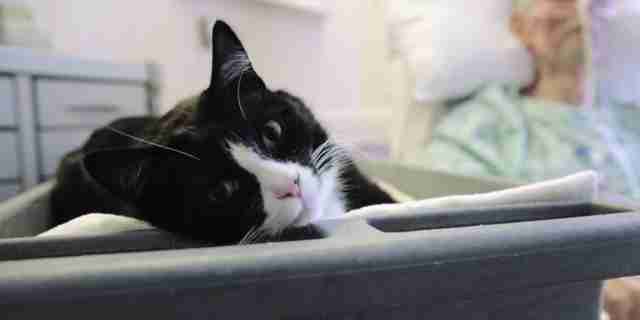 "He's an absolutely lovely, lovely cat," Elizabeth Fernandez, senior public information representative at UCSF, tells The Dodo. "He's so patient. I've watched him in action a number of times and he's given such consolation to our patients, and to our staff." But Duke's outreach work began long before he graced the halls of medicine. 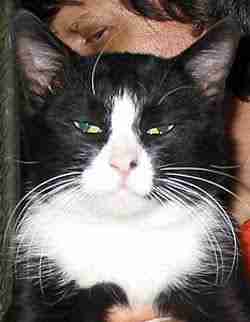 Back in November 2010, he reached out from a cage at San Francisco Animal Care and Control. And he found the heart of a 5-year-old girl named Isa Morris. 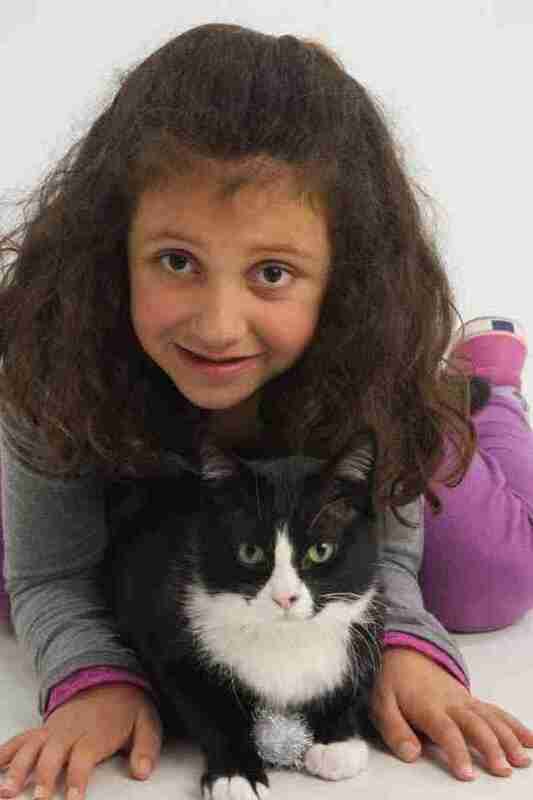 "My daughter fell in love with Duke," her mother, Jennifer Morris, tells The Dodo. Isa and Jennifer were visiting the shelter when they came across Duke, who had just been brought in, half-starved, from a feral cat colony. "We went into the cage area and Duke was very smitten by my daughter. So I figured the cat couldn't be all that bad," she says with a laugh. A couple days later, they came back to bring Duke home for good. But first Jennifer had to explain to her little girl that a once-feral cat doesn't adjust right away to family life. "You're not going to see Duke for a couple of days," she told her daughter. "He's going to find the nearest bed or piece of furniture and hide there." But Duke had other ideas. He sprang from his enclosure "and started surveilling the apartment like he already owned it," Jennifer says. "Already we had him coming over to meet people even that day and Duke would just hop on their laps and purr away," she adds. "Then we noticed when someone rang the doorbell, Duke would be there first, waiting for whoever the person is to walk in so he could greet him." It soon became clear that Duke's was meant for more laps and more cuddles than even the most enthusiastic little girl could offer. Jennifer enrolled him in the San Francisco SPCA's Animal Assisted Therapy Program. "He went to two different sessions to see if he was a good fit and he passed with flying colors," Jennifer says. "They did all sorts of tests. A whole bunch of employees from the SPCA sat in the room and Duke made the rounds going from person to person." Two years ago, Duke joined 17 animals - all of them dogs - who comfort patients at UCSF Medical Center. Duke was assigned to the intensive care unit. "They need to be very, very calm and they need to work well with new people," she adds. "And they need to like to be petted by strangers. It's okay. Duke's got this. 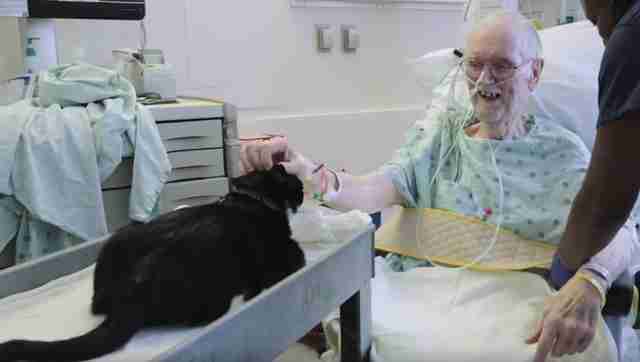 In fact, he turned out to be a natural, raising patients' spirits one purr at a time. Duke takes all the cuddles he can get before moving on to his next patient - with a little help from the cart that has become his trademark ride. "Initially we had one of the nurses carry Duke in from person to person," Jennifer says. "But Duke didn't like the feeling of not being able to see everything. 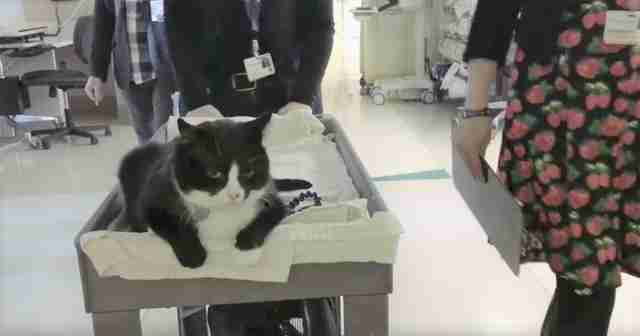 "We put him on a chair and he liked that, but of course, it didn't allow the patients to pet him so nicely." Finally, someone came up with Duke's rolling throne. Luckily, Duke's cart is now always parked at the ICU. And on any given day, you'll find him parked on a patient's lap - doing the job he was born to do. And then, of course, Duke goes home for more of the same - with the little girl who gave him a chance to shine in the first place.